Final Cut Pro X, Apple’s professional video-editing software, is adding some updates today that will integrate third-party apps directly within the editing interface. Though third-party plug-ins and special effects have already been available for the software, today’s news opens up Final Cut Pro X for third-party app developers to further streamline the editing workflow. “This is the first time we are allowing third-party app integrations at this level that tie so tightly to the FCPX engine,” an Apple spokesperson said. Apple is calling these third-party integrations “workflow extensions,” which match the Final Cut Pro X interface and allow editors to drag media between libraries, add clip markers, and sync playback between the apps and the Final Cut timeline. The first apps to be integrated today are Frame.io, Shutterstock, and CatDV, which can be downloaded for free from the Mac App Store. Apple says it’s currently working on a few more, and it will be adding more third-party extensions, like transcription service Simon Says, on an ongoing basis. 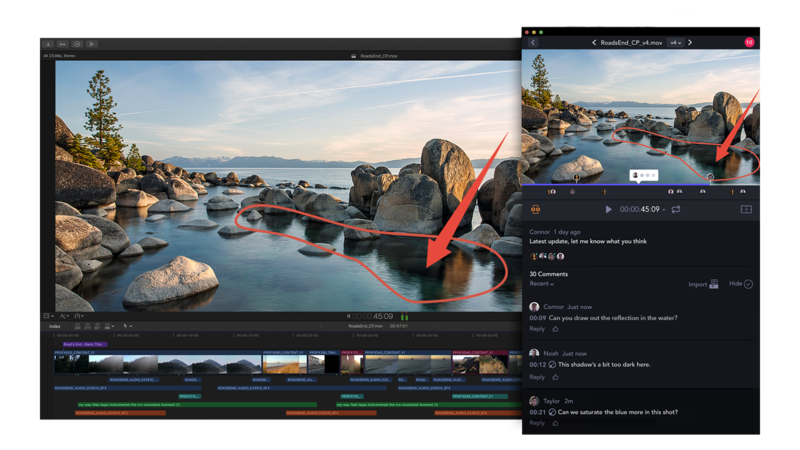 Frame.iointegration in Final Cut Pro X.
Frame.io is a collaborative tool that could be described as “Google Docs for video editing,” where multiple viewers can add notes to specific parts of a video. It’s useful for projects that require review by several people at once, so it’s used by lots of studios and media companies, includingThe Verge’svideo department. 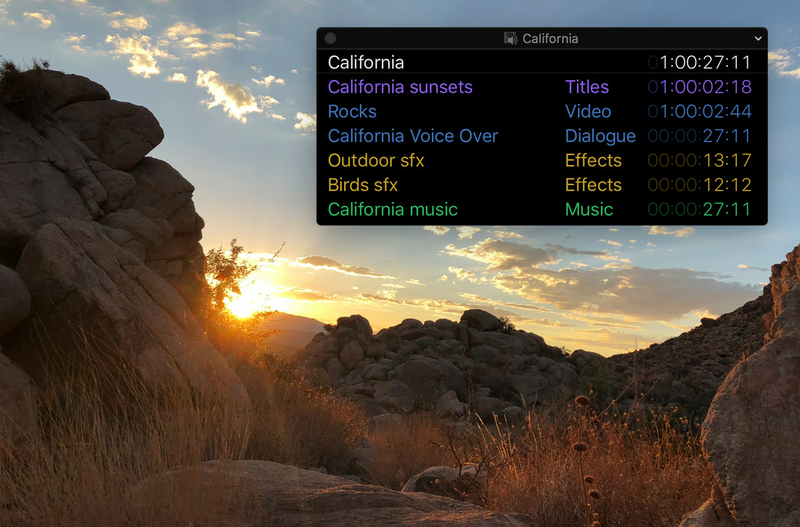 Other workflow extensions like Shutterstock will allow for browsing and purchasing of stock footage from inside the program, and CatDV will offer media asset management. Some features that Apple’s adding today have long been integrated into its rival products, like Adobe Premiere. This includes Frame.io interface integration and batch sharing, which allows users to export multiple clips at once. Other features are new and exclusive to Final Cut, like full support for SRT closed caption files. Words can be pegged to the clips themselves so that if a clip is rearranged, the subtitles are arranged with it. Coupled with the upcoming transcription service integration, Apple’s making it easier to create accessible videos, which can also be easily shared on platforms like Facebook and YouTube. Rearranging clips and subtitles. The blue bar above the timeline is the words pegged to the clips. Other updates include a Comparison Viewer, which allow editors to view reference images in a new window to keep a consistent look throughout their videos while grading. A new floating timecode window color-codes clip names, and improved noise reduction to minimize artifacts in low light or archival footage. Color-coded clips, roles, project and source timecodes. Today’s update also brings some new features to Motion, Final Cut’s motion graphics companion app, and Compressor, for encoding videos. Motion is getting color correction and grading features along with some new filters, and Compressor is moving to a 64-bit engine for encoding high-resolution, high frame rate videos. It will also now support SRT closed captions as well. Final Cut Pro X’s release in 2011 as the successor to Final Cut Pro 7 was polarizing for many video editors at the time, as project files weren’t compatible with each other, and the completely overhauled design was missing key features. Video pros were driven away and prompted to switch over to other software like Adobe Premiere within its Creative Cloud suite, which even has its own set of rival apps, like After Effects for motion graphics and Media Encoder for optimizing videos. Apple’s worked hard since then with regular updates to add these missing features through third-party plugins and tools, but today’s addition of workflow extensions and third-party apps feels like a significant effort on the company’s part to bring back those pro users. Final Cut Pro X is available on the Mac App Store for $299.99, while its companion apps, Motion and Compressor, are each $49.99. The updates are free for existing users.